Augsburg has received a grant from the C. Charles Jackson Foundation to support a one-year project to analyze the leadership activities currently in place within the co-curricular program on campus. The key purpose of this project is to review current practices around student leadership development and to determine consistency with the College’s mission to "nurture future leaders in service to the world." Students, faculty and staff have the opportunity to be a part of the project by completing a short survey on their experience and involvement with leadership development. The survey can be found at: academics.augsburg.edu/surveys/leadership.survey. Direct questions to Ramon L. Knox, Christensen Center 1B, 612-330-1111. 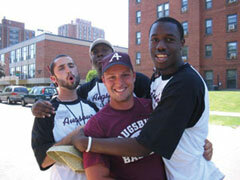 The Augsburg Leadership committee members are Nina Exley, Ann Garvey, Ramon Knox, and Will O’Berry.